This is an especially easy but remarkably tasty dish. It’s quick, so it makes a good lunch option, but you could easily have this for dinner… We don’t have kids yet, but I’d imagine that easy, quick dinners is what you want when you have little crazy (cute) people running around. Boil the pasta in salted water for about 10 minutes. Meanwhile, in a small saute pan, heat 1 tablespoon olive oil. 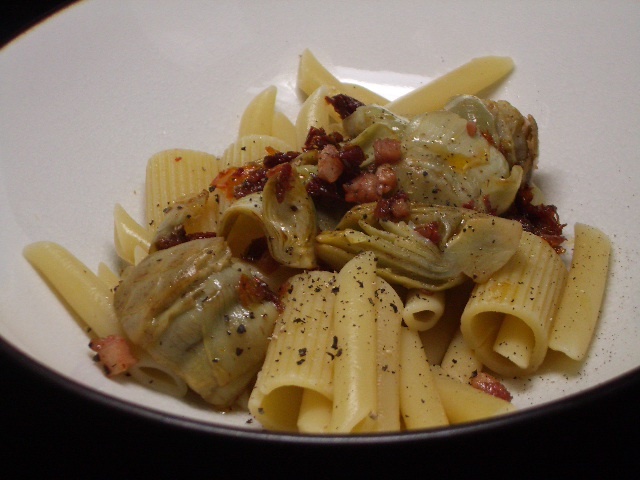 Add the artichokes, sun-dried tomatoes, and pancetta, and stir frequently. Drain the pasta. Put pasta into a large bowl. Sprinkle with salt and pepper and drizzle with a tablespoon or two of olive oil. Put the contents of the saute pan into the large bowl. Toss together, and serve.